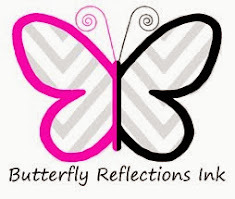 Hello Butterfly Reflection Inkers! 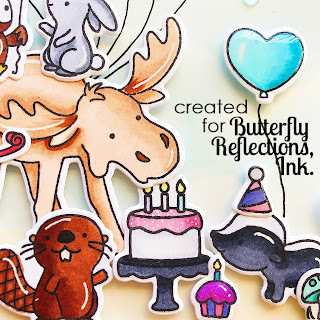 Lindsay Lajola here on the blog today with a fun new stamp set in the latest release from Hello Bluebird. 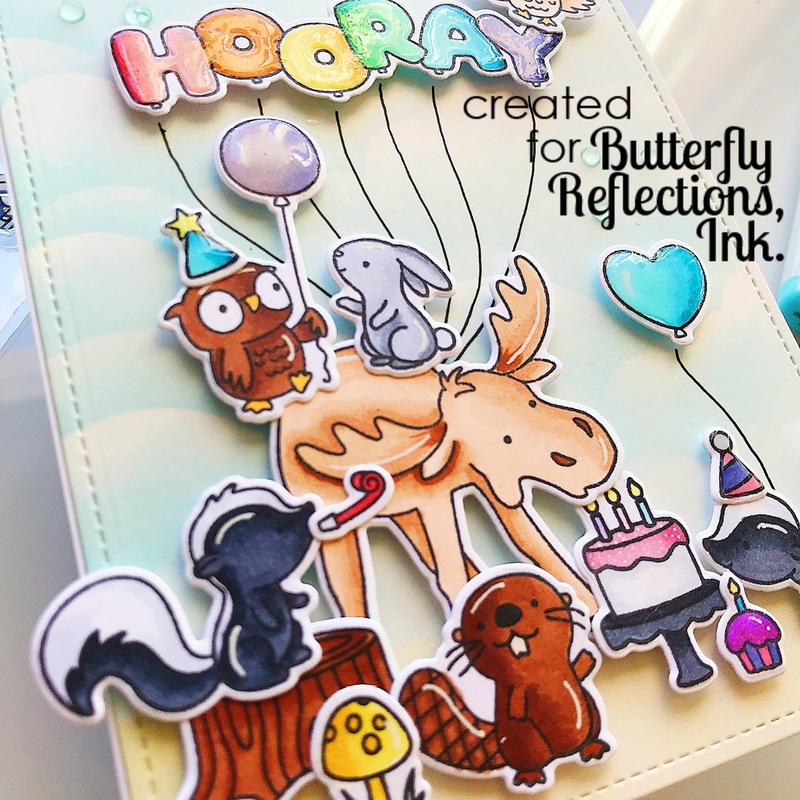 The stamp set I'm using is called Moose and Friends and I also used the coordinating die cuts to cut out my images. I stamped all of my images using my Mini MISTI with Memento Tuxedo Black ink, which is copic marker safe. When I first get a new stamp set, I like to stamp all the images and color them all, just to get a feel for all the stamp set has to offer. 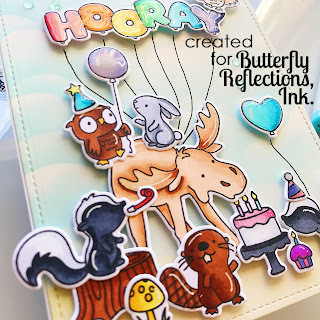 Today, I used almost all of the images on this card, because they're all just so cute I couldn't leave anyone out! 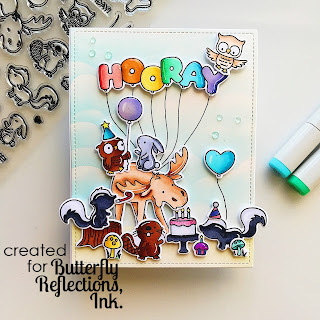 I decided to color the "Hooray" balloons in rainbow order using my stash of copic markers and added some Glossy Accents over the letters with a precision tip to make them look more three dimensional. I did this with all the balloons in the scene as well. For the background of the card, I started with a piece of Bristol Smooth Cardstock. I used the MFT Cloud Stencil and Tumbled Glass Distress Oxide Ink to make the sky part of the background. I masked off the bottom of the card using Purple Tape to keep that white while I inked up the clouds. When the sky was finished, I switched the mask over and used Old Paper Distress Ink to color the ground. After adhering all of my images using foam adhesive dots, I added details with a white gel pen and embellished with Nuvo Jewel Drops in Sea Breeze. 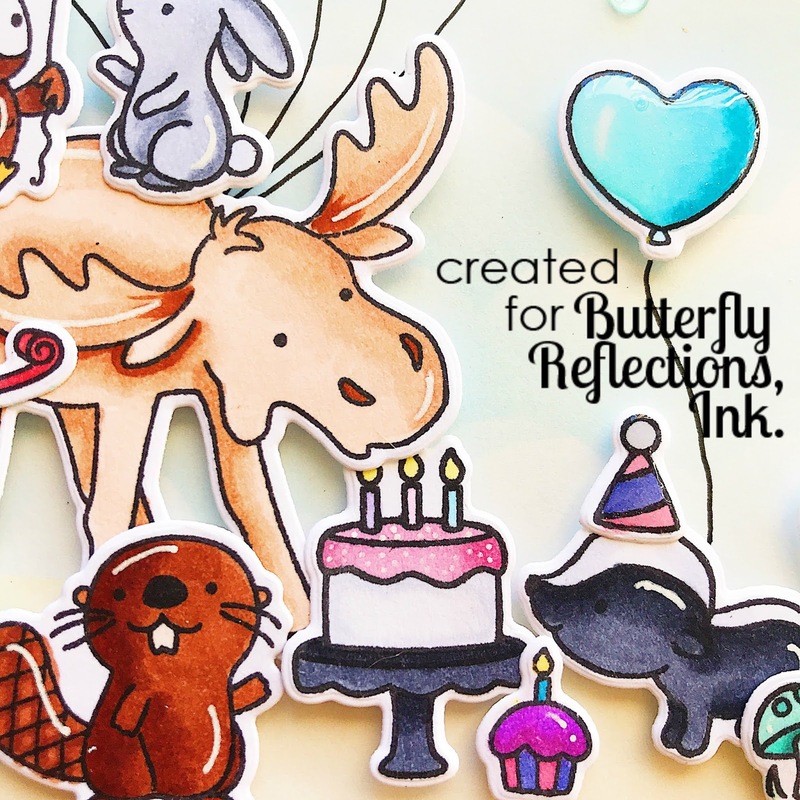 I hope you all enjoyed my card today and will check out the Butterfly Reflections, Ink store for all their super cute Hello Bluebird products!